The AFIS "GPS only" Flight Inspection System is highly portable and totally automated; it meets and exceeds the requirements of UK CAA CAP 670 and ICAO Doc 8071. It is a compact design that provides all the features of much larger systems. The AFIS includes features such as temperature and calibration monitoring, self-diagnosis and automatic log keeping. Data collection and analysis is automatic and comprehensive with synchronous position and event marking. Detailed analysis colour plots are produced in real time as each flight inspection progresses. The plots are later reproduced from the collected data on the ground. The real time data can also be transmitted to a remote terminal for ground engineers to monitor during the flight inspection (a useful feature during commissioning work). The AFIS system comprises airborne equipment and a ground based Differential GPS (DGPS) system, which is located at a convenient pre-surveyed position at each airport. The ground equipment is normally sited away from aircraft manoeuvring areas to minimise any operational disruption. The AFIS airborne equipment comprises a small lightweight unit housing the specialist navaid receivers, GPS receiver, data collection computer, telemetry transceiver and an operator laptop. 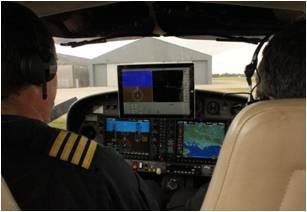 The AFIS also includes a separate pilot's head up display to assist with guidance and awareness. The AFIS equipment uses its own SBAS system to determine the aircraft's position in space within 20mm accuracy and to ensure accurate and repeatable results. The pilots head up guidance display provides the pilots with situational awareness and accurate guidance during the inspection runs. Each profile run is preprogramed into the system and can be selected by either the flight inspector or the pilots using the touch screen interface. The laptop computer provides the flight inspector with all the real time inspection and positioning data. The flight inspection software runs in a user friendly Windows environment using multifunction facilities with the data presented in a clear and precise graphical format. 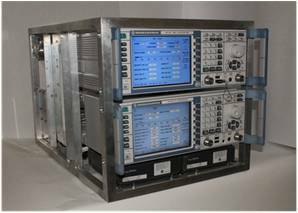 The PRS unit provides DGPS corrections to the aircraft to enable the AFIS airborne equipment to fix its position in space within ±20mm. The accuracy of this GPS only system far exceeds the flight inspection requirements for precision approach aids, such as PAR and ILS Cat III. The ground equipment is temporarily deployed at a convenient pre-surveyed point on the airport, which is normally remote from aircraft and vehicle operational areas. The unit is entirely automated and is left unattended during the flight inspection. 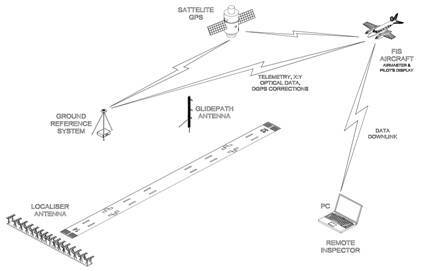 DGPS correction data is sent to the airborne flight inspection system via a dedicated telemetry link. Guidance information and inspection analysis is then provided to the pilot in real-time. (iii) Self-contained battery for up to 12 hours operation. Flight Calibration Services Ltd (FCSL) provides a mobile AFIS that is capable of easy installation on locally based light or medium size aircraft. This is a flexible cost effective solution for commissioning and maintaining navaids at airports in remote locations where the cost of deploying a Flight Check Aircraft is uneconomical. The compact lightweight design enables the equipment and crew to be deployed worldwide at short notice by commercial airline. The installation process is relatively simple, typically only taking 20-30 minutes, utilising existing aircraft antennas and power sources. The mobile AFIS does not require any structural changes to the aircraft's airframe or any additional antennas to be fitted to the aircraft. The Mobile AFIS solution utilising local aircraft offers customers a cost effective and rapid response capability.